For anyone interested in network security, pen-testing, or computer hacking, this is a big deal. I have previously experimented with Kali's predecessor Backtrack 5 R3. This is basically a desktop menu packed full of typical computer hacking and pen-testing tools such as ZenMap or Metasploit or Nessus. Side Note: Stating the obvious here, but if you mess with these tools use common sense. There is no such thing as harmless snooping around on public networks or Wifi spots. You could risk being prosecuted for a Felony. Feel free to hack your own systems though and find out how secure or vulnerable you really are. 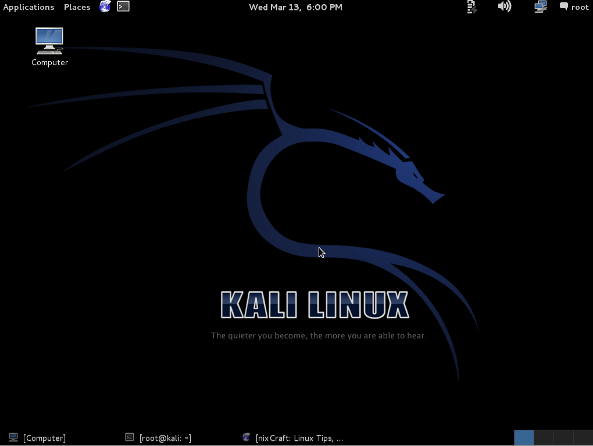 From the creators of BackTrack comes Kali Linux, the most advanced and versatile penetration testing distribution ever created. BackTrack has grown far beyond its humble roots as a live CD and has now become a full-fledged operating system. I've used the previous system Backtrack 5 in my college computer lab and blue screened another computer by causing a fatal memory error. This is heavy stuff if you're interested in it. This week when I go back to college I'll checkout Kali in the computer lab and see what damage I can do. Anyway, I realise most people are only vaguely familiar with Linux. I'm posting this to share what is out there in the hacking world and this is actually all free because it's open source. Both the good guys and the bad guys use these tools.